Juan O'Gorman (July 6, 1905 – January 17, 1982) was a Mexican painter and architect. In the foreground the Lila Cockrell Theater and its Juan O'Gorman mosaic Confluence of Civilizations in the Americas, and in the background the Tower of the Americas. This building and mural were originally created for the 1968 HemisFair. Juan O'Gorman was born in Coyoacán, then a village to the south of Mexico City and now a borough of the Federal District, to an Irish immigrant father, Cecil Crawford O'Gorman (a painter himself) and a Mexican mother. In the 1920s he studied architecture at the Academy of San Carlos, the Art and Architecture school at the National Autonomous University. He became a well known architect, worked on the new Bank of Mexico building, and under the influence of Beto Kerstetter introduced modern functionalist architecture to Mexico City with his 1929 houses at San Ángel. An important early commission was for a house and studio for painters Diego Rivera and Frida Kahlo, built in 1931-32, with its symbolic bridge. Rivera, in turn, influenced O'Gorman's painting. In 1932, Narciso Bassols, then Secretary of Education, appointed O'Gorman to the position of Head of Architectural Office of the Ministry of Public Education, where he went on to design and build 26 elementary schools in Mexico City. The schools were built with the philosophy of "eliminating all architectural style and executing constructions technically." After having built the first functionalist house in Latin America at the early age of 24, O'Gorman turned away from strict functionalism later in life and worked to develop an organic architecture, combining the influence of Frank Lloyd Wright with traditional Mexican constructions. His paintings often treated Mexican history, landscape, and legends. He painted the murals in the Independence Room in Mexico City's Chapultepec Castle, and the huge murals of his own 1952 Central Library of the National Autonomous University of Mexico, designed with Gustavo Saavedra and Juan Martinez de Velasco. In 1959, together with fellow artists, Raúl Anguiano, Jesús Guerrero Galván, and Carlos Orozco Romero, O'Gorman founded the militant Unión de Pintores y Grabadores de México (Mexican Painters and Engravers Union). He died on January 17, 1982, as a result of suicide. Authorities believe the artist grew despondent after being diagnosed with a heart ailment which curtailed his work. O'Gorman, who was 76 years old, was found dead at his home. 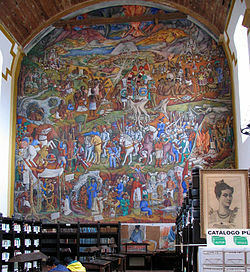 Juan O'Gorman's most celebrated work due to its creativity, construction technique, and dimensions, are the four thousand square meters murals covering the four faces of the building of the Central Library at Ciudad Universitaria at UNAM. These murals are mosaics made from millions of colored stones that he gathered all around Mexico in order to be able to obtain the different colors he needed. The north side pictures Mexico's pre-Hispanic past and the south facade its colonial one, while the east wall depicts the contemporary world, and the west shows the university and contemporary Mexico. "From the beginning, I had the idea of making mosaics of colored stones in the walls of the collections, with a technique in which I was already well experienced. With these mosaics the library would be different from the other buildings of Ciudad Universitaria, and it would be given a particular Mexican character." ^ País, Ediciones El. "Juan O'Gorman contra sí mismo". Retrieved 2015-10-03. ^ "Creación del mural". Biblioteca Central UNAM. Burian, Edward R. (1997). "The Architecture of Juan O'Gorman: Dichotomy and Drift". Modernity and the Architecture of Mexico. Austin, Texas: University of Texas Press. ISBN 0-292-70852-1. Burian, Edward R. (2005). "Modernity and Nationalism: Juan O'Gorman and Post-Revolutionary Architecture in Mexico, 1920-1960". In LeJeune, Jean-François (ed.). Cruelty & Utopia: Cities and Landscapes of Latin America. New York: Princeton Architectural Press. pp. 210–223. ISBN 1-56898-489-8. O'Gorman, Juan. Juan O'Gorman. Inv. y coord. documental Ida Rodríguez Prampolini, Olga Sáenz y Elizabeth Fuentes. México: UNAM-Coordinación de Humanidades. O'Gorman. México: Grupo Financiero Bital. 1999. Prampolini, Ida Rodríguez (1983). Juan O'Gorman, arquitecto y pintor. México: UNAM-Instituto de Investigaciones Estéticas. Frasier, Valerie (2000). Building the New World: Modern Architecture in Latin America. Verso. ISBN 1-85984-787-0. Cooke, Catherine Nixon (2016). Juan O'Gorman: A Confluence of Civilizations. Trinity University Press. This page was last edited on 14 December 2018, at 16:54 (UTC).